Can Seven-Minute Speeches Save a Magazine? The Talks are one such space for conversation, often on subjects covered in the pages of The Walrus. Despite a report of tumultuous internal affairs within the editorial department of the publication, the event series runs smoothly and generates much-needed revenue to sustain the respected magazine. 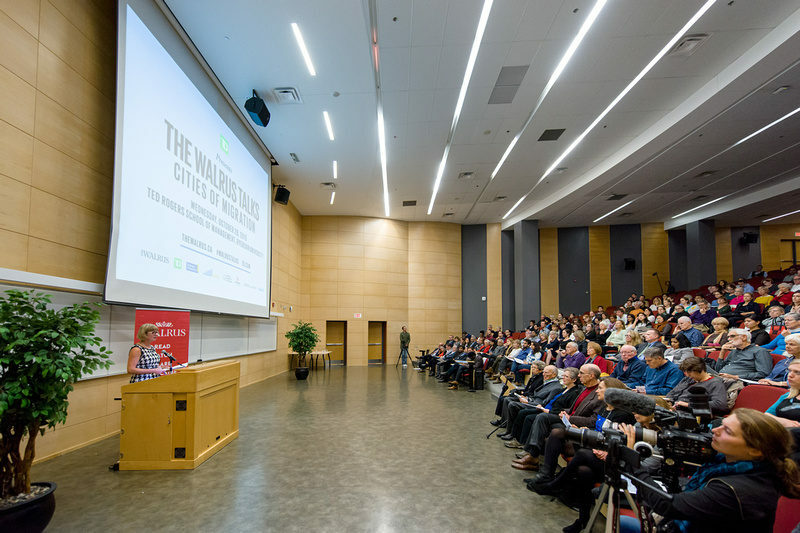 With approximately 20 Talks across the country annually, and an average attendance of 400 to 450 people, the series has allowed The Walrus Foundation to move its business model away from advertising dependence. This year, the Talks generated $1.3 million, making up approximately 27 percent of the foundation’s revenue. “It is our lifeblood,” says Shelley Ambrose, publisher of the magazine. She has run the Talks with David Leonard, the foundation’s event director, since 2012. The origins of the series date back to 2007. As a non-profit organization, The Walrus Foundation is restricted to a smaller ad revenue than mainstream commercial magazines, and when the financial slowdown hit and advertisers began pulling out, the already limited ad base became even more precarious. To find the just-right way to do this, Ambrose played Goldilocks: some events were too long, some too disorganized and some too old-fashioned, boring and ineffective. “We were looking for a format that allowed for a lot of ideas with the right length of time,” she says. “Anything over 90 minutes, your bum is numb, your brain is tired, you’re thirsty and you need to pee.” A former CBC radio producer, Ambrose settled on an arrangement akin to live radio: eight speakers delivering seven-minute speeches about one broad “Walrus-y” topic—a serious issue such as resilience, water or transportation. Occasionally, the topics come together with stories in the magazine in a way that highlights the symbiotic relationship. This unity was evident at “The Walrus Talks Transportation.” “This is a perfect world,” says Ambrose. “We’re talking transportation. The magazine’s cover story is on Uber by Jon Kay. Jon Kay is a speaker tonight.” In this way, the Talks generate revenue for the magazine, but they also create content as contributors become speakers and vice versa. Leonard and Ambrose have already booked 21 Walrus Talks for next year. For each one, Leonard will fly to the host city, help the speakers prepare, set up the venue and live-tweet the speeches. One constant at each event is a big red poster for The Walrus Foundation that sits next to the podium, the words Read and Watch visible from every corner of the room. The word order is inaccurate, because without the revenue generated from people watching the Talks, there would, perhaps, be no Walrus to read.